The Moon is often associated with the feminine mystique and intuition. Alternatively, the moon signifies your changing moods. The crescent moon symbolizes cyclic changes, renewal and movement. You are progressing smoothly toward your life path. “She rides the moon” indicates the female power over the moon and her association with it including psychic intuition, feminine wiles and a disarming or seductive nature. 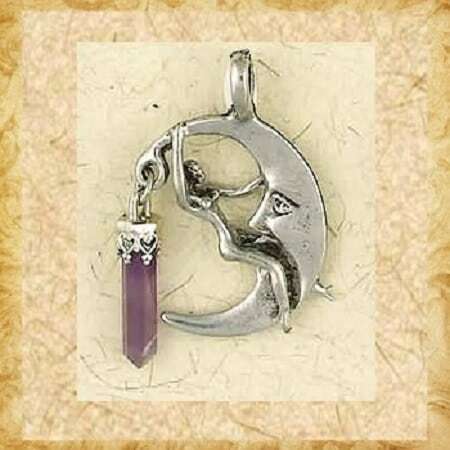 This beautifully crafted fine pewter moon measures 1 inch long and 1 inch wide and the crystal point is 1 inch long. 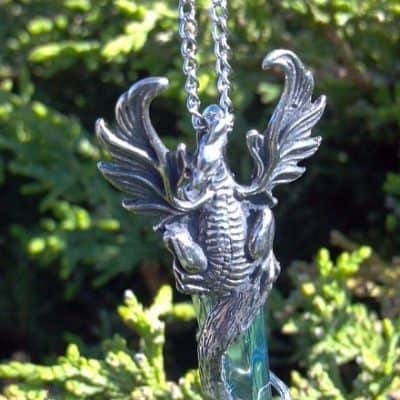 It comes with the healing and metaphysical information about your stone and how to work with, use and cleanse your pendant. It also comes with an organza pouch for storage and a 22″ long plated chain. Aqua Aura can work as a shield from psychic or psychological attack. 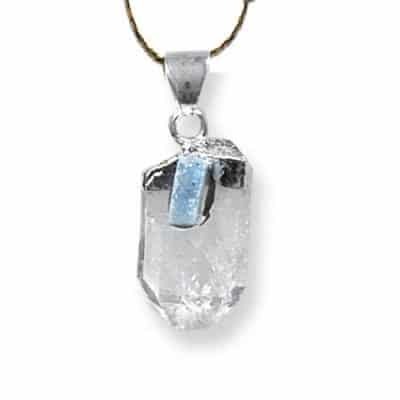 This is truly a `master’ vibrational crystal, as with all energies the conscious use of this energy towards enlightenment is always the prime goal. It has an energy that can enhance one’s intuition and communication, calm one’s nerves, and energize one’s mental abilities. Green Quartz also called Prasiolite, helps to stabilize and open the Heart Chakra therefore, promoting a greater capacity to love more unconditionally. It is a stone of tranformative energies. It inspires creativity, attracting success, prosperity and abundance. It is a stone of growth and it has the ability to connect one to the greener side of nature. 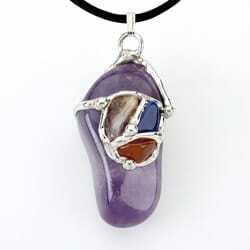 It has historically been used to transmute negative energy to positive energy. Clear Quartz is a master healing stone. This crystal resonates to the frequencies within our body helping us to vibrate at a level of peace, tranquility and strength. It is used for clear thought and thinking. 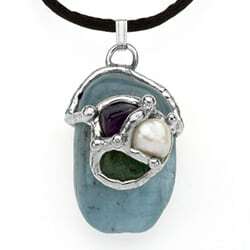 This stone transmutes energy and helps in guiding our search for the meaning and importance of existence. Clear Quartz is considered the “stone of power”. A dedicated healer.